The indoor retractable golf net consists of archery netting hung onto movable hooks giving you the ability to practice and teach indoors and hit out onto the driving range. 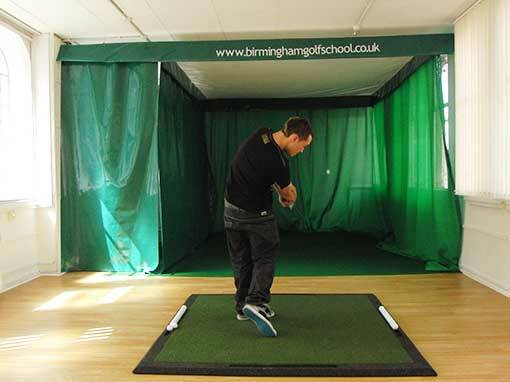 Our indoor retractable golf nets will make your facility even more rewarding and versatile. 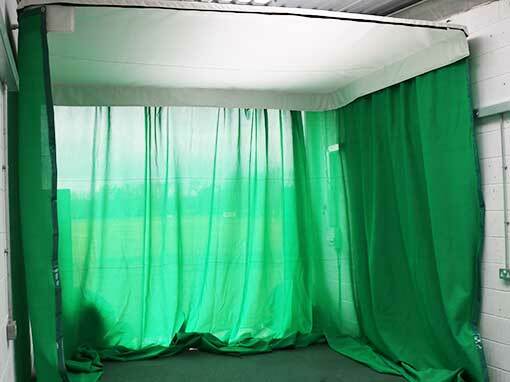 The green archery netting curtain can either be drawn around to use the facility as an indoor golf academy, or alternatively, the curtain can be retracted and the golfer can hit the ball down the range. Available in to suit any design and area, our trackway and netting system will ensure you receive maximum income from your area. The high impact archery netting will absorb the impact of the golf ball making the area safe when installed. We manufacture the item in house and we can offer a full installation service if required. Advertising or sponsorship can be incorporated onto the white PVC Padded Pelmet and on many occasions, either all or part of the cost of the indoor net has been covered by the advertiser or sponsor. The complete indoor golf enclosure consists of a trackway, 4 rounded corners, archery netting, roof net, padded pelmet, hooks runners and wall brackets.